Open edition Character Booster Set. The set features Mickey, Donald, Minnie, and Goofy. This is for a unopened box of 2 pins. Star Wars The Force Awakens Mystery Collection features ten (10) pins of characters from The Force Awakens feature film. This listing is for an unopened box of 2 pins. A mystery set of 10 pins featuring classic Disney villains In a comic book print with their classic sayings. one box contains 2 random pins. Villains include Maleficent, Scar, Hades, Queen of Hearts, Cruella De Vil, Chernabog, Jafar, Hook, Ursula, and Frollo. Box artwork and Chernabog pins contained the spelling error "Moutain". This listing is for a sealed, unopened box. This listing is for the Mickey Expressions mystery box. Each box contains two mystery Mickey Expressions pins. Pins in this Mystery Set are: 101992: Wink Wink 101993: Snooze 101994: Grrrr 101995: Too Cool 101996: Nerd Alert 101997: Meh 101998: LOL 101999: Bummer 102000: What? TThis mini-pin collection features Mickey and friends hang out at the beach and wearing sunglasses. Villain Shoes Mini-pin Set of 7. Released at both Disneyland Resort and Walt Disney World on Sept 13, 2013. Ask Mickey ... Friends are Forever! Mickey Mouse, Donald Duck and Goofy have gathered together for some Pin Trading fun. Now you can join the Pin Trading Family at Walt Disney Parks and Resorts with this Pin Trading Starter Set. This set has everything you need to start trading Disney Pins with friends and Disney Cast Members wearing an official Disney Pin Trading Accessory. The set contains four pins - two to keep and two to trade - and a lanyard with lanyard card. Four pin booster set that includes Anna, Elsa, Olaf, and The Arendelle Kingdom. Each pin is shaped like an oval, with a white border with snowflakes around the main subject in the middle. The card these pins come on features Elsa and Anna at the bottom, with the frozen logo, and the kingdom behind them with mountains and snowflakes. Open Edition Pin Booster set has six pins. Each pin is a skull and crossbones design themed to one of six Disney characters. Those characters are Mickey Mouse, Minnie Mouse, Donald Duck, Goofy, Pluto, and Daisy. This is a four pin booster pack that features Stitch from Disney\'s Lilo and Stitch. It features Stitch dressed up as a hula dancer, alien Stitch in his red jumpsuit, Stitch with bra and cape as a superhero, and Stitch with sunglasses enjoying an ice cream cone. The four pins come on a blue themed backing with Stitch\'s name, in yellow, at the top. This listing is for a sealed, unopened box. This mystery pin collection features Disney characters dressed as characters from Disney Pirates of the Caribbean movies. Each box contains two (2) randomly selected pins. Pins in this collection include: #83689 - Mickey Mouse as Jack Sparrow with crossed swords Logo #83690 - Pete as Blackbeard #83691 - Mickey as swashbuckling Jack Sparrow #83692 - Stitch as Captain Barbossa #83693 - Pirate Pluto #83694 - Pirate Chip and Dale #83695 - Pirate Goofy #83696 - Mickey as Jack Sparrow in compass #83697 - Donald Duck as Will Turner #83698 - Minnie as Angelica Note: This pin collection will be shared between Disneyland® Resort and Walt Disney World® Resort. This listing is for a new, unopened box. This Alice in Wonderland Mystery Set features the characters borrowed from Mary Blair's concept art. There are 8 pins in this collection. Each box contains 2 randomly selected pins. Pins in this set: #106299 - White Rabbit #106300 - Queen Of Hearts #106301 - Caterpillar #106302 - Cheshire Cat #106304 - March Hare #106305 - Alice #106306 - Mad Hatter #106307 - Tweedle Dee & Tweedle Dum This is released at WDW and DLR. Complete or begin your Hidden Mickey collection with this mystery pouch containing two (2) random selected pins. Four pin booster set featuring Disney babies wrapped in blankets. Set includes: #115221 Bambi, 115222 Stitch, Pin 115223 Cheshire Cat, 115224 Simba. This is for a sealed, unopened box of pins only. This limited release Star Wars mystery collection features Star Wars characters with zodiac signs. Each box contains two (2) randomly selected pins. This collection features 12 limited release pins and 12 limited edition 500 chaser pins. This collection includes: #96538 - Virgo Queen Amidala #96539 - Gemini Anakin Skywalker/Darth Vader #96540 - Aries Han Solo #96541 - Libra Obi Wan Kenobi #96542 - Taurus Yoda #96543 - Leo Lando Calrissian #96544 - Aquarius R2-D2 #96545 - Capricorn Luke Skywalker and Princess Leia #96546 - Pisces Admiral Ackbar #96547 - Sagittarius Wicket the Ewok #96548 - Cancer Chewbacca #96549 - Scorpio Darth Maul Chasers: #96627 - Pisces Admiral Ackbar Chaser #96628 - Aries Han Solo Chaser #96629 - Aquarius R2-D2 Chaser #96630 - Libra Obi Wan Kenobi Chaser #96631 - Gemini Anakin Skywalker/Darth Vader Chaser #96632 - Taurus Yoda Chaser #96671 - Leo Lando Calrissian Chaser #96698 - Capricorn Luke Skywalker and Princess Leia Chaser #96858 - Virgo Queen Amidala Chaser #96859 - Sagittarius Wicket the Ewok Chaser #96860 - Cancer Chewbacca Chaser #96861 - Scorpio Darth Maul Chaser Note: This pin collection will be shared between Disneyland® Resort and Walt Disney World® Resort. This listing is for an unopened box of the it's a small world Mystery Collection 2016. Each box contains two randomly selected pins. The collection is made up of 8 different mystery pins: Mexico #119944, India #119945, American Cowboy #120105, Clock Face #120388, China #120389. Hawaii #120390 Dutch # 121110 Russia #121111 pins Back stamped: FAC Authentic Official Pin Trading 2016, DISNEY MADE IN CHINA. Pin has mickey head waffle pattern and two nubs on either side of post. Each UNOPENED box contains two randomly selected pins. The 10-pin collection includes: Luke Skywalker, Leia Organa, Finn, Chewbacca, Rey, R2-D2, C-3PO, BB-8, Poe Dameron, and Rose. Each is framed in Star Wars: The Last Jedi logo and Alliance Starbird design. Each box contains two randomly selected pins. The 10-pin collection includes: Luke Skywalker, Chewbacca with Porg, Rey, Finn, Rose, Poe Dameron, Kylo Ren, Captain Phasma, Judicial Stormtrooper and Supreme Leader Snoke. Pins measure: 1 1/4'' W x 1 1/4'' H. Enameled cloisonné. Gold tone finish. Mickey icon pinbacks. Whether you're for the Resistance or the First Order, wear your allegiance with this six-piece pin set inspired by Star Wars: The Last Jedi. Created especially for Walt Disney World Resort and Disneyland Resort. Six-piece pin set features First Order Heavy Assault Walker, Resistance pilot helmet, ski speeder, Porg, blaster and Elite Praetorian Guard. Enameled cloisonné. Pewter finish. Mickey icon pinback. Inspired by Star Wars: The Last Jedi. Pins measure up to 1 1/4'' W; 1 1/4'' H. Card: 5 1/2''. Metal / enamel. Imported. This is an unopened mystery box that contains two randomly selected pins. The collection is made up of eight pins. Pins in the collection are Tod and Copper, from The Fox and the Hound #120513; Baymax and Hiro, from Big Hero 6 #120514; Ariel and Flounder, from The Little Mermaid #120512; Lumiere and Cogsworth, from Beauty and the Beast #120515; Olaf and Sven, from Frozen #120516; Joy and Sadness, from Inside Out #120519; Timon and Pumbaa, from The Lion King #120520; and Bambi and Thumper #120521. The bottom of each pin says BFFs in different colors. This mystery box is sold on the Shop Disney Parks App, Shop Disney Parks website, Disney Theme Parks, Resorts and Downtown Disney/Disney Springs. This is the box from the Villains Tsum Tsum Mystery Collection. The collection has 9 pins in the set: Evil Queen, Captain Hook, Cruella, Maleficent, Maleficent Dragon Lady Tremaine, Dr Facilier, Ursula, and Jafar as Genie. Each mystery box has two pins. This is for a sealed box of the Frozen Diamond Pixel Mystery Set. This 8 pin mystery set features characters from Frozen on blue diamonds in a cute style that is pixelated. Each box contains 2 randomly selected pins. The characters in this set are Anna (#125541), Elsa (#125538), Olaf (#125539), Sven (#125544), Snowgies (#125545), Marshmallow (#125537), Bulda (#125542), and Grand Pabbie (#125540). Listed on DisneyStore/shopDisney.com as Frozen Holiday Sweater Mystery Set. For search purposes: cross stitch, sweater, argyle, dot matrix, snowman, princess, reindeer, troll. Aladdin Mini pins, 4 including the Genie as a Bee (Always BEE yourself! ), the Scarab Beetle, the Magic Lamp, and the Flying Carpet. 4 pin set released in the parks 2017. This set was released at the Love Is An Adventure pin event in August 2017. And later at both Walt Disney World and Disneyland Resort. The pins are not Limited Edition. The four pins have Cinderella’s slipper on a purple pillow; Jac and Gus in a teacup; Cinderella’s carriage; and a logo with a blue background with yellow and gold letters “Bibbidi Bobbidi Boo”. Separate pin listings of this set are pinpics #s: 124094, 124095, 124096 and 125097. This listing is for an unopened box of the Star Wars Retro Mystery Pin Set featuring characters from the Star Wars movies 4-6. Characters in this set include: Chewbacca, Darth Vader, Boba Fett, Tie Pilot, C-3PO, Stormtrooper, R2-D2 and Jawas. The 8 pin set is a shared release between WDW and DLR and each box contains two randomly selected pins. The pins have one pin on the back, close to the top of each pin. It has the Mickey waffle pattern backing with 3 boxes: Disney Pin Trading logo box, STAR WARS logo box, and ©Disney, © and ™ Lucasfilm Ltd., Made in China box. Darth Vader (#122013), Boba Fett (#122015), Tie Pilot (#122012), and Stormtrooper (#122014) pins were previously released as part of Pin #122008 - DLP - Star Wars Helmet Booster Set. This 4 pin set features characters from Star Wars: SOLO. The pins are: Chewbacca with the words, Chewie Is My Copilot; Han Solo with the words, I've Got a Good Feeling About This; the Millennium Falcon with the words, Best In The Galaxy; and a sign type of pin with the words, Just Made the Kessel Run in 12 Parsecs. This 6 pin Booster set features characters from Star Wars: SOLO. The pins are Solo, Chewbacca, two spaceships, and two Stormtrooper helmets. Han and Chewie both have dark goggles on. One Stormtrooper has 3 accents of red, black and yellow behind the helmet, the other helmet is ringed in black. One spaceship is accented with a starburst design behind it, the other is ringed in a circle of red blocks. Mickey Mouse body parts Set. Features four pins: classic black Mickey ears, white glove, red shorts and yellow shoes. Alice in Wonderland Icon Set. Features 4 pins: Green Mad Hatter's Hat with 10/6 card; Alice's blue dress with a white apron/pinafore; Teacups - blue, purple, and pink stacked on a white saucer; and a yellow Doorknob with a face. This listing is for a sealed, unopened box of pins. This open edition Monsters University mystery collection features eight (8) pins with characters from the Pixar movie. Each box contains 2 randomly selected pins. The pins are: #103265 - Mike Wazowski #103308 - Archie the Scare Pig #105359 - Scott "Squishy" Squibbles #105360 - Randall #105569 - Art #106758 - Johnny Worthington III #106764 - James P. "Sully" Sullivan #106772 - Don Carlton Released at both WDW and DLR. The set features cameos of portraits in the Haunted Mansion. The cameos are set in silver-tone frames, and they have invisible ink features under UV light. Size = 1 1/2” h x 1” w. Each box contains two randomly selected pins. This Mystery Box Set, titled "Disney Park Attractions" features 8 pins, each depicting a different ride or attraction from the Disneyland and Walt Disney World parks: The Yeti from Matterhorn Bobsleds (DLR) / Expedition Everest (WDW) #115787; Bruce, Nemo, and Dory from Finding Nemo Submarine Voyage (DLR) / The Seas with Nemo and Friends (WDW) #115788; Alice and the Cheshire Cat from the Mad Tea Party (DLR / WDW) #115789; the Keyring Dog and Imprisoned Pirates from Pirates of the Caribbean (DLR / WDW) #115790; Aladdin and Jasmine on the Magic Carpet with Fireworks from Aladdin's Oasis (DLR) / The Magic Carpets of Aladdin (WDW) #115791; the Hitchhiking Ghosts and Madame Leota from The Haunted Mansion (DLR / WDW) #115792; Ariel and Flounder from Under the Sea Journey of the Little Mermaid (DLR / WDW) #115793; and Maleficent from Fantasmic (DLR / WDW) #115794. Each box includes two random pins. The box art features the castle behind blue and dark blue stripes, fireworks, and Tinker Bell. This listing is for a new, unopened box. The 8 pins in in set all feature Dory, with her unconventional speech. 4 of the pins are on a pale green background and the other 4 are on a blue background. This 8 pin mystery collection features favorite Disney Characters in the old 8-bit video game style. Characters in this collection are Mickey Mouse, Minnie Mouse, Pluto, Goofy, Donald Duck, Daisy Duck, Chip and Dale. Each box contains 2 randomly selected pins and will be available at both WDW and DLR starting March 2017. This listing is for a new unopened box of Disney Streets Disney Parks mystery pin set. This Walt Disney World Resort Mystery Collection features characters peeking over street signs with their names on them. There are 8 pins in this collection. Each box contains 2 randomly selected pins. They are Mickey Ave, Minnie Lane, Daisy Lane, Donald Blvd, Pluto Ave, Goofy Cir, Chip Rd, and Dale Blvd. Honor the beloved self-rescuing princess with this fun four-pin set. A must-have for Star Wars fans, it features itty bittys® stylized versions of Princess Leia from the original trilogy—including her iconic white gown, Hoth outfit and Endor poncho outfit—as well as her General Leia look from Star Wars: The Force Awakens. Each pin is made with high-quality enamel color fill and features a rubber pin back and measures 1.3" H.
"The Lion King" Icons 4 pin set. Simba, Timon, Pumba, and the famous phrase Hakuna Matata. Timon and Pumba being the colorful characters that they are, while Simba is represented as his Iconic symbol synonymous to Simba himself. Then the favorite and or most popular phrase from the movie "Hakuna Matata" no worries. This 3 pin set was given to guests who stayed at the Walt Disney World Caribbean Beach Resort during the 2018 construction process. The set includes the following pins: Goofy relaxing in an inner tube, Minnie Mouse in sunglasses drinking from a straw, and Donald jumping into the Fuentes del Morro Pool. The three pins are on a card stating: Bon Dia and thank you for being our Guest. We'd like to share our appreciation for your patience while we're working our magic around the Resort with these special keepsakes as our gift to you! This set resembles the 2017 Construction 2 pin set (Pin 124184), however this set has the addition of the Minnie Mouse pin. Pin set includes three pins from Tim Burton’s Nightmare Before Christmas. Pins feature Lock, Shock, and Barrel. Characters are not wearing their masks, and are walking off to the left with various weapons and boxes in their arms. This Open Edition mini pin collection contains seven pins of emblems from the Star Wars™ universe. This open edition mini-pin set features seven (7) Cute (cutie) Character pins. Each mini-pin measures approximately .75". This open edition mini-pin set features seven (7) Cute (cutie) Character pins. Each mini-pin measures approximately 1". Our pins all feature the rubber Mickey Shaped backing. Disney Trading Pins Vinylmation Collectors Set - Toy Story This open edition mystery collection features the characters from the Disney-Pixar's Toy Story films on the Vinylmation™ form. Each set contains six (6) pins, and an additional mystery pin of one of five different styles from the Disney-Pixar's Toy Story ™ Vinylmation™ collection. This mini-pin collection features seven (7) pins featuring the Disney characters as Nerds. The characters are dressed in geeky clothes and oversized glasses. This open edition set features little girls dressed as Disney Princesses. This mini-pin collection features seven (7) pins featuring the Disney characters as Nerds. The pins feature just the heads of the characters. This is for a sealed, unopened pouch of pins only. This open edition Mystery Set features sixteen (16) pin designs. Each pouch contains five (5) randomly selected open edition pins. The collection features Disney characters with their best friend. This open edition Mystery Set features sixteen (16) pin designs. Each pouch contains five (5) randomly selected open edition pins. The collection features Disney couples. Each pin measures about 1.25" tall by 1.25" wide. This listing is for a sealed unopened pouch. Each mystery pouch contains (5) randomly selected Mickey Mouse shaped pins. This seven (7) piece Open Edition Mini Pin Boxed Set features Mickey Mouse and the gang as Cute Characters ready to set sail on a Disney Cruise Line® Cruise Ship. Artwork for this Boxed Set was created by Disney Design Group Artist Adrianne Draude. This listing is for a sealed, unopened pack. This is the open edition Nesting Dolls Mini Pin Pack. Each pack contains five randomly selected pins. There are sixteen pins in this collection. This listing is for a sealed, unopened pack of pins. This Open Edition Mickey Mouse and Friends Donut Mystery Mini-Pin collection has 15 pins in the collection. The pins look like donuts that are frosted with the colors representing different Disney characters. Each pack comes with 5 randomly selected pins. This listing is for a sealed, unopened pack. This is the open edition Disney Tsum Tsum Pin Pack. Each pack contains five randomly selected pins. There are sixteen pins in this collection. The 16 pins are: #108001 - Mickey Mouse #108002 - Minnie Mouse #108003 - Oswald the Lucky Rabbit #108004 - Dumbo #108005 - Donald Duck #108006 - Daisy Duck #108007 - Pluto #108008 - Goofy #108009 - Dale #108010 - Chip #108011 - Stitch #108012 - Tinker Bell #108013 - Winnie the Pooh #108014 - Piglet #108015 - Tigger #108016 - Eeyore This pin collection was released in WDW and DLR. This booster pack was released in 2015 at WDW and DLR. It features all of the emotions (Joy, Sadness, Fear, Disgust & Anger)from Inside Out and also Bing Bong. This is a 6-pin Avengers Assemble booster pack available at WDW and Disneyland Resort. Set includes Captain America, Thor, Iron Man, Hulk, Nick Fury and Hawkeye. Open Edition Booster pin set currently available at Disneyland and Walt Disney World - features six individual pins of favorite Disney felines. Pins in this set include: #110467 the Cheshire Cat from Alice in Wonderland; #110465 Marie from The Aristocats; #110131 Figaro from Pinocchio; #110464 Lucifer from Cinderella; #110421 Si and Am from Lady and the Tramp; and #110461 Oliver. This booster pack has 4 pins with some of our favorite characters; Winnie the Pooh & Piglet, Elsa & Anna, Pinocchio & Jiminy Cricket, and Stitch & Scrump. The Finding Dory Booster Pack includes Dory, Hank the Octopus, Bailey the Beluga, an Otter, Destiny the Whale Shark and Nemo. This listing is for a sealed 5 pin pouch of the Star Wars Stormtrooper Helmets Mystery Set. collection of 16 pins based off the Star Wars Legion project that featured different artistic takes on Stormtrooper helmets by various artists from across the Walt Disney Company, including Lucasfilm, Industrial Light and Magic, Marvel, Pixar, as well as fans. Each collectible pin pack contains 5 randomly selected pins. Pins in collection include: 116176, 116178-116180, 116250, 116251, 116253-116262. 2016 Disney Character Booster Pack 6 pin set. 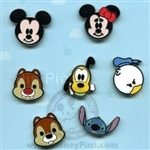 Pins in this set include: Mickey Mouse # 116093, Stitch # 116097, Tinker Bell # 116096, Winnie the Pooh # 116095, Tigger # 116097 and Cheshire Cat # 116098. Pins are made of silver colored metal. This listing is for a sealed, unopened pack. This is the open edition Disney Tsum Tsum Mystery Pin Pack - Series 2. Each pack contains five randomly selected pins. There are sixteen pins in this collection. The 16 pins are: #116160 Jiminy Cricket; #116161 Thumper; #116162 Lady; #116163 Tramp; #116164 Patch; #116165 the White Rabbit; #116166 Bambi; #116167 Cleo; #116168 Perry the Platypus; #116169 Pinocchio; #116170 Alice; #116171 Marie; #116172 Sven; #116173 Cheshire Cat; #116175 Olaf; #116174 Figaro. This pin collection was released at WDW and DLR. For search purposes: Pinocchio, Bambi, Frozen, Lady and the Tramp, 101 Dalmatians, Alice in Wonderland, Phineas and Ferb, The Aristocats. Pins in Pack #2: #116160-116175. This booster collection features classic Star Wars characters in kaleidoscopic form as snowflakes. Characters in this collection are Boba Fett, Darth Vader, Stormtrooper, R2-D2, Yoda, and C3-P0. This 16 pin mystery collection depicts some of our favorite characters in cute cartoon-like stylized form. Characters in this collection are Mickey Mouse, Minnie Mouse, Donald Duck, Tinker Bell, Winnie the Pooh, Alice in Wonderland, Mushu (from Mulan), Jiminy Cricket, Mike Wazowski (from Monsters Inc.), Peter Pan, Tigger, Hercules, Dopey (from Snow White and the Seven Dwarfs), Simba (from The Lion King), Chip, and Dale. Each pouch contains 5 randomly selected pins. This 16 pin mystery collection features race cars in designs inspired by classic Disney characters. each pouch contains 5 randomly selected pins. Pins in this collection are The Cheshire Cat (Alice in Wonderland) #119551; Simba (The Lion King) #119552; Baymax (Big Hero 6) #119553; Mickey Mouse #119553; Sorcerer Mickey #119554; Stitch (Lilo and Stitch) #119555; Jiminy Cricket (Pinocchio) #119556; Steamboat Willie #119557; Roger Rabbit (Who Framed Roger Rabbit) #119558; Genie (Aladdin) #119559; Ezra the Hitchhiking Ghost from the Haunted Mansion #119560; Pirates of the Caribbean #119561; Sheriff Woody (Toy Story) #119562; Jack Skellington (The Nightmare Before Christmas) #119563; Mad Hatter (Alice in Wonderland) #119564; Tigger (Winnie the Pooh) #119565; and Kermit the Frog (The Muppets) #119566. This 6 pin set features character faces next to 2017 written out with a yellow 2, blue 0, green 1, and red 6. Each pin has the character on the left with a blue star and two silver stars on the right. The characters in this set are Tinker Bell, Sorcerer Mickey, Stitch, from Lilo and Stitch, Dory, from Finding Dory/Finding Nemo, Donald Duck, and Simba, from The Lion King. This is for a sealed package of Tsum Tsum Series 3 mystery pins. Each bag contains 5 randomly selected pins. There are 16 pins in this collection: 120144-120151 and 120156-120164. Michael Darling, #120164; John Darling, #120163; Wendy Darling, #120162; Peter Pan, #120160; Tinker Bell, #120159; Tick Tock, #120158; Smee, #120157; and Hook, #120156, all from Peter Pan. Elliot, #120151, from Pete's Dragon. Akela, #120151; Shere Khan, #120149; Mowgli, #120148; King Louie, #120147; Kaa, #120146; Baloo, #120145; Bagheera, #120144, all from The Jungle Book. This six pin collection features classic characters dressed as characters from the Hollywood Tower Hotel attraction/Twilight Zone Tower of Terror. The pins in this set are Minnie Mouse, Mickey Mouse, Goofy, Peg Leg Pete, Donald Duck, and Daisy Duck. This 6 pin booster set features famous Adventureland Icons in Tsum Tsum form. The characters in this set are Jose, Tiki God, Orange Bird, Barker Bird, and Showgirl Bird, from the Enchanted Tiki Room, and the Jungle Cruise Skipper. From DisneyStore.com: The collectible six-piece set includes popular characters from the Adventureland attractions reimagined as cute Tsum Tsum pins. The pins are featured on a backer card that is perforated to separate the pins onto individual cards. Tsum Tsum 6 pin set representing the Haunted Mansion attraction characters. The back of the pin has the silver Mickey icon waffle pattern. There is one post with one nub on each side. The serial number stamped on the back reads FAC-046730-16096. Pins in the set: Ghost Bride #116574; Madam Leota #116575; Gus #116578; Phineas #116579; Ezra #116983; Maid #116985. This is a four pin set. Each pin is a carousel horse. The first is a horse wearing a Peter Pan hat with other characteristics of the movie/attraction. The second is a horse designed to look like Maleficent in dragon form with large black wings. The third is a pink horse covered with candy and cupcakes. The fourth pin is light blue with bats and other characteristics of the Haunted Mansion. There are two pin posts on the back of each pin. The FAC (FAC-036223-16351) is printed on the back of each pin. This 6 pin booster set features different emoji style Stitch faces from the Disney Emoji Blitz video game. The 6 pins are Stitch happy (#122998), nervous (#122999), sticking out his tongue (#123001), heart eyes (#122996), embarrassed (#122997), and laughing (#123000). This 6 pin booster set features different emoji style Frozen Anna and Elsa faces from the Disney Emoji Blitz video game. The 6 pins are Elsa Blowing a Kiss, Elsa Laughing, Elsa Smiling, Anna Nervous, Anna Smiling, and Anna Laughing. Backstamp is ODPT on left, Copyright Disney, Made in China on the right and FAC code below. This listing is for a sealed, unopened pack. This is the open edition Disney Tsum Tsum Mystery Pin Pack - Series 4 which highlights the movies Aladdin, The Little Mermaid, and Tangled. Each pack contains five randomly selected pins. There are sixteen pins in this collection. The 16 pins are Ariel (123204), King Triton (#123205), Sebastian, Flounder (#123212), Rapunzel (#122875), Mother Gothel (#123214), Flynn (#122874), Pascal (#123213), Genie (#123210), Jasmine (#123206), Aladdin (#123209), Abu (#123207), Sultan (#123208), Iago (#123203), Rajah (#123202), and Scuttle (#123211). Individual Pins have backstamp ODPT on the left, FAC code above Copyright Disney Made in China on the right. The 8 pin set of the Kingdom of Cute Mystery Collection. Each box contains two mystery pins relating to the Disney parks. Peoplemover #122541; Dole Whip #122537; Jungle Cruise #122539; Sword in the Stone #122540; Space Mountain #122534; teacup #122532; Dumbo #122535; Gargoyle Haunted Mansion #122536. This listing is for a sealed, unopened pack. This is the open edition Disney Tsum Tsum Mystery Pin Pack - Series 5 which highlights Pixar characters. Each pack contains five randomly selected pins. There are sixteen pins in this collection from seven different movies: Wall-E (#126070) and Eve (#126071); It's a Bug's Life: Dot (#126072), Flik (#126073), and Heimlich (#126075); Finding Dory/Finding Nemo: Dory (#126074); Ratatouille: Linguini (#126076) and Remy (#126077); Up: Russell (#126078), Carl (#126079), Kevin (#126080), and Dug (#126081); Monster's Inc: Mike (#126082) and Sulley (#126083); Toy Story: Buzz (#126084) and Woody (#126085). Individual Pins have backstamp ODPT on the left, Copyright Disney/Pixar Made in China on the right above a centered FAC code. For search purposes: robot, ant, caterpillar, fish, rat, chef, bird, dog, little chef, Carl Frederickson, Sheriff. This five pin Booster Set features characters from the movie Moana released at Disneyland Resort and Walt Disney World Feb. 2018. It includes pins of Moana with a paddle, Hei Hei the rooster, Maui with his fish hook, Tamatoa, the Giant Crab, and three Kakamora, the coconut Pirates, standing on each other's shoulders. This collectible pin pack is available at both Disneyland and Walt Disney World Resorts. there are five (5) randomly selected pins in each. There are 16 pins in total for this collection. Each pin is a little over 1" in height. The bags represent the various Princesses (Snow White - apple) or Minnie (red dots) or a female villain (Maleficent - black and purple dragon horns). This set was originally released at the Love Is An Adventure pin event in August 2017. It is not a Limited Edition. The four pin set has a white castle tower with a purple roof; the green chameleon Pascal; a yellow lantern with a purple sun; and Rapunzel, the Tangled princess with long blonde hair, wearing her purple dress and leaning on her elbow while gazing upwards. Set of three mini pins from the movie Zootopia features the emojis Judy Hopps, the bunny rabbit, Nick Wilde the fox and Flash the sloth. Each pin is about 1 inch and is lenticular, showing one of two expressions depending on how you hold the pin. Pins have glitter accents, enameled cloisonné, and a pewter tone finish. They come on a card in a set of three available at the Disney Store beginning on December 27, 2017. The Little Mermaid Icons. Features 4 pins: dinglehopper (fork), Shell from Ursula's necklace, Ariel silhouetted on rocks against the moon, and the Flower from Ariel's hair. This listing is for a sealed Ice Cream Mystery Pack. Each pack contains 5 randomly selected pins. This collection of 16 pins in a mystery bag features various characters as ice cream bars or popsicles. The characters included in this collection are Tinker Bell, Cheshire Cat, Goofy, Heimlich, Donald, Sulley, Jack Skellington, Pluto, Minnie, Marie, Lilo, Baymax, Flounder, Tigger, Mickey, and Lucky. 6 Pin booster set includes three Wall-e and three Eve emoji. Set includes Normal Wall-E, Happy Wall-E, Sad Wall-e Pins, Normal Eve, Happy Eve, and Angry Eve.